You’ve found the dress, you’ve outfitted your bridal party and even managed to find some swag for dad. The rest is easy! Planning for your honeymoon is one of the most relaxed parts of wedding planning. If you’re like us though, you believe no such event should occur sans shopping trip. So for you ladies of luxury, planning a tropical honeymoon in paradise — we’ve got you covered. Keep reading to discover your new must-haves! First things first — you’ve got to pack your goodies in something! 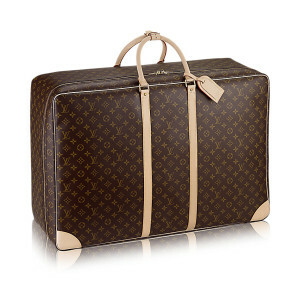 You simply can’t go wrong with Louie Vuitton. LV is so iconic because their designs never go out of style! Here’s hoping your plane ride to your honeymoon destination is nothing like “Snakes on a Plane”. Your snakeskin sneakers on the other hand, will undoubtedly turn some heads! If you’re looking to travel in comfort and style, (and who isn’t?) these designer sneakers are for you. If you’re planning on doing a whole lotta nothing on the beach with your babe, you’re going to need a swimsuit that makes you feel like a million bucks! Lucky for you, one-piece swimsuits are back and better than ever. This striped suit puts off some serious retro vibes, but features the very modern, low-cut back that is so trendy right now. *Disclaimer — You’ll need a beach bag this large by the time you’re done reading this list. 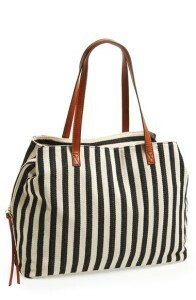 We’re overly obsessed with this oversized tote for two reasons. 1. It’s big enough to carry your stuff and his (but don’t tell him that). 2. It has a seriously classic beachy vibe, while remaining seriously chic. While you’re soaking up the sun with your sweetie, remember, there’s nothing glamorous about skin cancer. This luxury product protects your skin from harmful UV rays, while reversing signs of aging. For those days when you just want to wear your swimsuit all day long, you’ll need something breezy and beautiful to throw on. It’s not every day you see a denim colored cover-up, which is why we love this one! Speaking of sun protectants, let’s talk sunglasses! 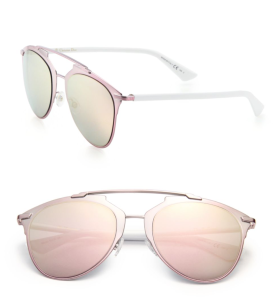 Dior does a beautiful pair in this seasons trendiest color, rose gold. Protecting your retinas from the sun has never looked so chic. Spending a day exploring your tropical paradise? Rompers are the perfect way to look like a goddess without putting in the effort of putting together an outfit. Just throw on this gorgeous, teal number on and you’re ready for a day out and about with your handsome man! Because you can’t run around barefoot for your entire honeymoon, you’ll need something basic and comfortable that you can dress up or down. Steve Madden can do no wrong in this department. Dinner date for two? Continue Your Year in White with this crochet maxi. The pretty, romantic look of it really sells us. The crochet fabric (i.e.breathable) is just a bonus. Perfect for a romantic getaway on an indescribable (and hot) island. You know we had to include this somewhere on our list! A little lingerie never hurt anyone, so if you’ve never been the type to wear something so luxurious to bed, your honeymoon is the time to try it out. 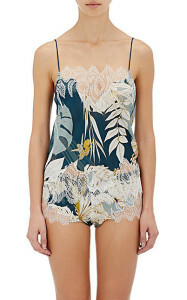 Nothing too scandalous here — just a fun, tropical printed, short and tank set in satin. Hope you found this list fun and useful! Which of these luxury items (if not all of them) will you be taking with you on your honeymoon? If you’ve already taken your honeymoon, what’s the number one thing you would recommend packing? Discuss in the comments!